The 82nd Academy Awards will be held this Sunday. The event is telecast live worldwide and the Academy claims it will be watched by over one billion viewers, making it the fourth most watched live television broadcast, after the Super Bowl, Olympics Opening Ceremony and World Cup Final. If you are one of the many billions who can’t watch the Oscars live on TV, I’ve found a couple of mobile sites where you can follow the festivities using your mobile browser. The official Oscars site at m.oscar.com was created by Netbiscuits for The Academy of Motion Picture Arts and Sciences and ABC, Inc., the official Oscars broadcaster in the US. It lists all of this year’s nominees and promises to have live coverage starting at 8 PM EST on Oscar night. It’s not clear if the live coverage will be streaming video or text, but I suspect the later. While you’re waiting for the show to start you can view hundreds of photos of stars on the runway from the last five years of Oscar or read a detailed history of the Academy Awards. The site also has 35 videos including a multi-part “Road to the Oscars” piece, explanations of the science behind some of the nominees for technical awards and video interviews with nominees, hosts and writers. Unlike last year, there don’t seem to be any trailers from the nominated films. The videos are served in a variety of formats and should work on any video capable device ranging from basic feature phones to the iPhone. You can also sign up on the site for live text alerts featuring news about the nominees, information about special promotions, and live updates throughout the show (standard text messaging rates apply). 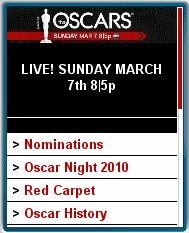 According to mobilizedtv.com one site that will definitely stream live Oscars videos to mobiles is AP Live Entertainment . It’s a new partnership between the Associated Press and Livestream.com which launch with a special Oscars Red Carpet show Sunday from 6 to 8 PM EST. The show’s main draw will be live streaming video of celebrities walking up the red carpet as they enter the Kodak Theater for the event. AP reporters will also post live updates during the awards ceremony and from Oscar after parties well into the evening. One caveat is that Livestream apparently only works with the iPhone, iPodTouch, Android devices and recent BlackBerrys. I tried some of the site’s other mobile streams of my N95-3 and got nothing. This entry was posted in Entertainment and tagged academy awards, oscars, video by Dennis Bournique. Bookmark the permalink. The iPhone APP from LIVESTREAM does work – impressive. mobile.livestream.com is the link – you click on ALL CHANNELS and it comes up towards the top. It’s kind of working on my Android phone too but the video freezes after 20 seconds although the audio continues. might help if we knew what the link for the Oscars was? It’s unclear – are we downloading an APP from the store or is it the above link – I just scrolled through the livestream channels and saw nothing about AP or Oscars. Anyone know? I’m hoping it works cause then we can do it too. I’m afraid I don’t have a deep link to the Red Carpet show. The interview on mobilizedtv.com that I linked to is the only online reference I’ve found to it. That interview does say that it’s web based and not an app. Neither AP or Livestream are doing anything to promote the mobile version of the AP Live Entertainment or the Red Carpet show. I’m starting to have doubts that it’s actually going to happen. I guess we will find out tomorrow.